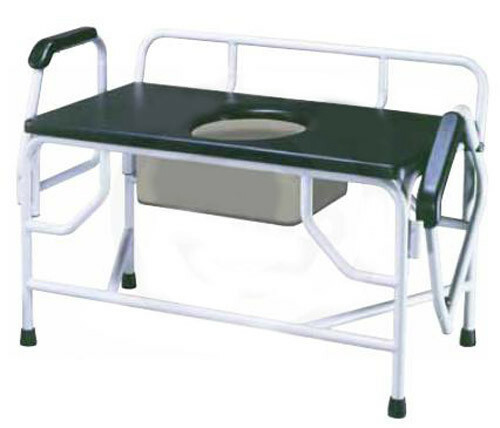 This Extra-Large Bariatric Drop Arm Commode is made of heavy-duty steel that's powder coated to be easy to clean and maintain. 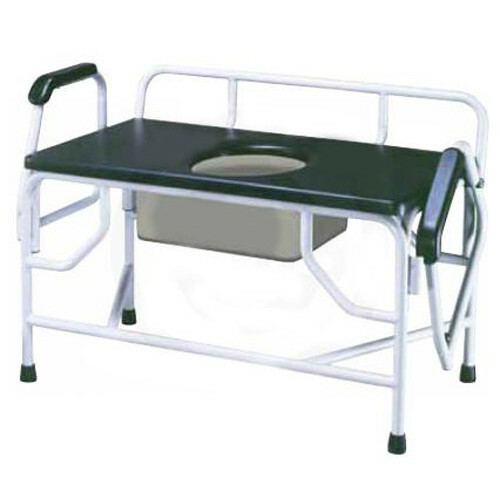 Its sturdy steel construction makes it possible to support large patients up 1,000 pounds who need a bedside commode due to limited mobility. The drop arm feature allows for safe lateral transfers to and from the commode. The seat offers a large surface area that is void of fasteners or anything that can injure the patient. The hole cutout measures 8-1/2 x 12 inches and is centered around an extra-large under mount commode bucket. The bucket is removed from behind and comes with a cover. Drive Medical manufactures bathroom assist products for bariatric patients. You may also be interested in the Bariatric Transfer Bath Bench.